This is one gorgeous silver King Saxello! Original silver plate, original case, pads are sealing, and it plays well. The King Saxello is definitely the vintage King that generates the most interest, and rightly so. It is a bold, innovative design that accomplishes two things at once. The curved neck moves the body tube down onto the neck strap for a nice, easy feel. And the upturned bell projects the sound out and up so that you can hear yourself better than on a straight soprano. Cosmetically, it does not get much nicer than this. This horn has no dents or dings and no past repairs. It has almost all of its original silver plate. The bell is really beautiful on these horns, with delicate engraving and bright silver. Saxello’s are usually beat up, and this is one of the rare survivors. Someone should grab this quickly before it disappears! Here’s a career-making lead alto for someone to pick up. It also includes a fresh overhaul just finished! The Super 20 altos with sterling neck and bell and gold leaf on the silver bell are perennial favorites for lead alto players because of their bright, warm, singing tone that easily cuts through a band or a section. You get that classic Cannonball/Charlie Parker King alto tone that is warm and bright at the same time. It’s “that sound” that everyone thinks of in a jazz alto. The SilverSonics with gold leaf are really uncommon. and this is a rare chance to get a clean, beautiful, problem-free example of this alto. Grab this horn before it’s gone. It is even nicer in person than it looks in the photos. Everyone wants a King SilverSonic. This one was made in Cleveland in 1965. It has a solid silver neck and a solid silver bell. This horn is priced much lower than one normally sees SilverSonic tenors selling for, because the bell looks relacquered to me. The lacquer actually looks like the right color and style, so it was probably done by King. The engraving looks great – nice and sharp, much like an original lacquer horn. This is a good deal, and this horn should make someone really happy. There’s only one available. Get it now before it’s gone! This is a great deal on a King SilverSonic Tenor that is beautiful, has a fresh, full overhaul, and is a superb player. It is loud and projecting. This horn was original lacquer when I got it, at about 75%, and I had the lacquer stripped and the horn gently hand polished when it was overhauled to remove the dirt and tarnish. It cleaned up great! It’s now bare brass and silver, and it has all new everything: a complete restoration consisting of mechanical work, new pads, corks, felts, everything leveled and properly setup. This horn is now ready to go for many years to come, and it is in better than new playing condition. This is a beautiful, original lacquer King Super 20 Alto Saxophone from 1950. It has pearl side keys and G# like Cannonball Adderley’s Super 20, and Charlie Parker’s Super 20. It has that tone too – warm, projecting, jazzy. It’s pretty hard to beat. This horn is in excellent condition. Cosmetically, it has almost all of its original lacquer intact, and it has no dents, no dings, no past repairs. The original, solid silver neck has the matching serial number. The original case is even in excellent condition. The engraving is beautiful, including on the bell keys. This is a near mint condition, original lacquer King Super 20 Alto SN#308xxx with full pearls and solid silver neck. It has no dents, no dings, no resolders and 99% lacquer at least. This is about as nice as you will find for a 60 year old horn. It comes with the near mint original case with case key, and it still has all original pads as well. With an old Meyer piece, it is easy to sound a lot like Cannonball Adderley without too much work. This is one of the greatest vintage altos you can get, and it is one of the most beautiful as well. This horn should make someone very happy, and I’ll be sad to see it go when it sells. This is an excellent condition, original lacquer King Super 20 Alto SN#339xxx with full pearls and solid silver neck. This is a primo serial range for Super 20 altos, and this one features the more comfortable left hand pinky setup that some people really like. It has a fresh overhaul done by Steve Collins for me, and it feels *really* good under the fingers. I am sorely tempted to keep this one because it just SINGS! Tonally, it is Cannonball all the way and super-responsive. This is one great horn, and I will be sad to see it go when it sells. Its last gig was playing Charlie Parker with Strings in a NYC show! This is a turn-key purchase for a superior King alto that should make even the pickiest players very happy. The King Super 20’s that were made in Cleveland (like this) are the most desirable type among most players and collectors. (As a side note, the early Eastlake horns can also be very good.) The unusual thing about this alto, is that it is original silver plate, which you almost never see on a Super 20. I have heard of a few other original silver Super 20’s, and one gold plated one, but there are VERY FEW of these out there. So this is one of those “good luck finding another one” type of horns. It looks to me like a factory special order, a one-off made for a customer who paid extra for a custom silver alto. The King Super 20’s that were made in Cleveland (like this) are the most desirable type among most players and collectors. (As a side note, the early Eastlake horns can also be very good.) This one is original lacquer at about 90% with some honest wear from playing on the back of the bell (which doesn’t show when you’re playing). Grab this one at a good price and get it overhauled how you like, and you’ll have a cool professional vintage horn for less than a new Yamaha. This is a later King Super 20 alto sax made in Eastlake. It’s not a super-late Eastlake, like some you see. It’s still a Super 20 design, just with the brass neck instead of silver. 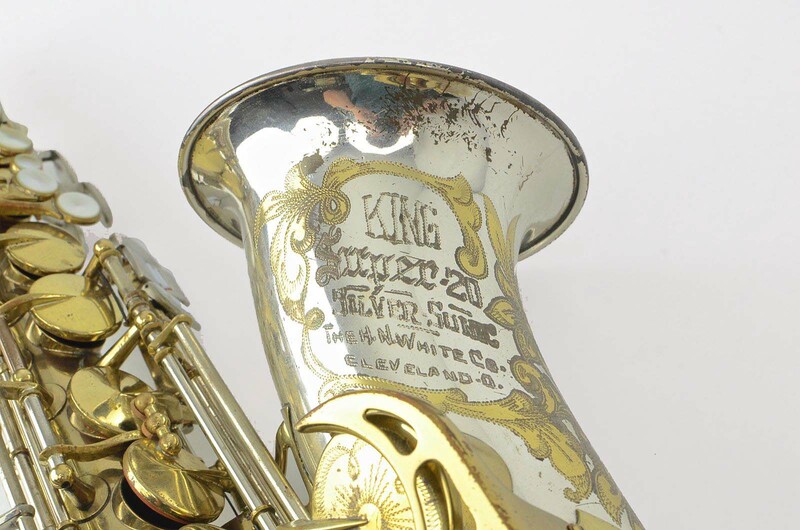 The lacquer on this horn looks like other original lacquer later Kings that I have seen before, so it looks like original lacquer to me – no evidence of buffing, lacquer over wear, or overspray/touch ups. Any of you King experts out there let me know if your eyes see anything differently. This should be a good chance to get a structurally sound King Super 20 in beautiful shape for a seriously good price. This is a very clean, original lacquer King Super 20 alto! It is one of the nicest ones I have seen, and even has some of the original gold lacquer remaining on the solid silver neck, which only the most gently used Super 20’s do. It has the original case, end plug, even the lyre screw intact. Just a beautiful example of one of the best altos ever. As far as I am concerned, the 50’s King Super 20 is the jazz alto. It’s the total package of beauty, craftsmanship, tone, ergonomics, and sheer pleasure. Pair it with a GS Special Alto mouthpiece, and you’ve got an unbeatable combination. It’s what I play, anyway. The price includes a full overhaul! If you are looking for one of the best jazz altos I have played, this is it. It is a freshly overhauled King Super 20 298xxx from 1948-9, and it has a very good overhaul that will last for a LONG time with nothing more than regular maintenance. The tone on this horn is that concentrated essence of mainstream jazz alto that people look for in a Super 20. It has a flexible, punchy, medium bright tone with a unique “American” core that is powerful and projecting. Very free blowing – easy altissimo. This is lots of fun to play. Pair it with a NY Meyer, and you sound a lot like Cannonball Adderley tonally. This horn is already sold, but if you are wondering what a factory relacquered King Super 20 looks like, it looks like this. As you can see, the pads, resonators and lacquer are correct for a King of this period, but there is lacquer over the pearls and just enough little hints to show that it is definitely redone. Comes in a nice original case as well. This horn was a good player, as many relacquers are when they are in good physical condition with a good overhaul. This horn pre-sold off our waiting list, so if there is a specific horn you want, please contact us and we will let you know first before it becomes available more generally. This is an excellent condition, original lacquer King Super 20 Alto SN#336xxx with full pearls and solid silver neck. This is a primo serial range for Super 20 altos, and this one features the more comfortable left hand pinky setup that some people really like. It has a fresh TenorMadness overhaul (costs around $1400) and feels really good under the fingers. Tonally, it is exactly in that classic Cannonball Adderley tonal universe. It’s that jazz alto sound that is in your ears and in the air at book stores and coffee shops everywhere. It’s also a super-responsive horn. It makes you just want to play and play. I have had a lot of luck finding good Super 20’s recently– they are just such great altos, it’s hard to exaggerate how much fun they are to play. This is an excellent condition, original lacquer King Super 20 Alto SN#336xxx with full pearls and solid silver neck. This is a primo serial range for Super 20 altos, and this one features the more comfortable left hand pinky setup that some people really like. It has a fresh TenorMadness overhaul (costs around $1400) and feels really good under the fingers. The overhaul is really important to how a horn plays, and this one deserved a really good overhaul. This was only done a couple of years ago, so the pads are still very fresh and in excellent condition, and I have also just had it setup again to my very picky standards. I have kept this as my personal alto for the last year – it is Super-Awesome. King Super 20 Alto Saxophone 290xxx Original Overhauled! Tonally, this is just a gorgeous alto to play. It has that “King thing” – a lively, projecting, soulful kind of core tone that is natural for jazz and lends itself to a wide range of settings. It is medium dark tonally – Super 20s are robust and brightly lyrical generally, but this is more lush and thick than some of the later ones. It recently had a a full overhaul by the best repairman in Germany, Max Frei, for 1200€ ($1475), and it is about as mechanically perfect now as it could possibly be. This is a turn-key purchase for a super example of a Super 20. This horn is going to make someone really happy! This is the best jazz alto on the site right now. It kills. Kings have a bit of a learning curve because there are so many different versions of the Super 20, and each version has its particular features. This is one of the best versions of the Super 20 in my opinion, and comes from 1947-8. It has original lacquer, a solid silver, double socket neck, and full pearls (pearl side keys and G#). This is a turn-key purchase for a super example of a Super 20. This horn is going to make someone really happy! King Super 20 Alto Saxophone 298298 Original Fresh Overhaul! I have been spending the last couple of years getting to know King saxophones better. Kings have a bit of a learning curve because there are so many different versions of the Super 20 and Zephyr and each version has its particular features. This is one of the best versions of the Super 20, and comes from 1957. It is the only horn that competes price wise with the Selmer Mark VI, and with good reason – these things are great. More rich, and complex than a modern Yamaha etc, but naturally full-bodied and projecting. Cannonball Adderly famously played a Super 20, and I suspect that his tone is more than anyone else’s – the quintessential jazz alto sound. King Super 20 Alto Saxophone Full Pearls Series II 1953 333537 Excellent! This warhorse of a Super 20 Baritone will blow the walls down. Since this is one of the most beautiful saxophones that I have ever seen, this horn is in my personal collection. If you have something equally interesting that you want to trade, I’m open to that. This is a super-clean, original lacquer King Super 20 tenor saxophone that has the matching solid silver neck and pearl side keys. These are generally speaking the most desirable versions of the Super 20 saxophones, and have a rich, flexible tone that makes this a natural jazz tenor. I really love these horns, and I heartily recommend this to anyone who wants a great jazz tenor, and who wants to own an unusually-well-preserved example of one of the highest-quality saxophones ever made in the USA. This is a super-clean, original lacquer King Super 20 with solid silver, double-socket neck. The tone of this horn is classic Super 20 from the best era. It has that warm, medium bright, full-bodied, projecting sound that people love in these horns. 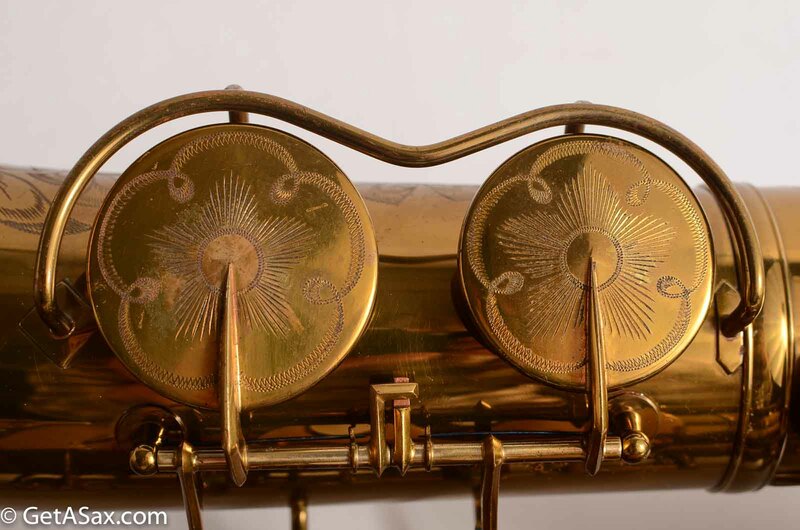 It is one of the nicest Super 20’s that I have seen, and the whole horn, neck, and case all look remarkably clean. I see no evidence of any past repairs or damage to the horn. It just looks great. The current pads are also in good condition and look like they haven’t been played much, so this should be good to go for quite some time without a repad being needed. If you have been looking for a nice Super 20 tenor, but you have been frustrated that most of the available options looked really beat, look no further. King Super 20 Tenor 382k Original Lacquer Near Mint and Overhauled! King Super 20 Tenor 443xxx Original Lacquer and Clean! This is a beautiful, original lacquer Super 20 tenor. It has very little wear and still plays a bit on its old pads, but it could use a repad soon. Offered here at a lower price to be a deal for someone. This is a super clean example with no more than a few small dings removed and nothing resoldered, and no serious repairs of any kind. It’s just a solid horn and promises to be a very good player as well. It’s not every day that I can call a horn among the nicest I have seen. This one is, among Super 20 tenors. This is a bold, loud Super 20 tenor that will cut through a band with ease. Priced low on the chance that it might not be original lacquer. This is one of the nicest King Super 20 Tenors that I have had in for sale. It is in gorgeous original condition, with original pads. Nobody has messed with this horn. The factory gold lacquer is still on the solid silver neck! A really clean King is about 10x harder to find than a clean Mark VI, and this is it. This is a horn that I might end up just keeping. If you are looking for a Super 20, this is the vintage to get. Full pearls on side keys, palm keys and G#, lots of engraving, double socket neck. Neck is solid sterling silver, which gives you an unbeatable tone. This horn is one-owner! Super 20 tenors from the best vintages are about 10x more rare than a 5-digit serial Selmer Mark VI. It is actually really hard to find one that is clean and nice like this. It makes a good investment too. This tenor is an exceptionally fine player. Includes premium overhaul and used Hiscox case. You won’t find a better playing Super 20. King Super 20 Tenor Saxophone 285199 Full Overhaul! Freshly overhauled! This beautiful original lacquer King Super 20 is very hard to beat. It has a BIG, wide medium dark tone. Tons of volume – it goes to 11. The silver neck gives it some focus and zing, with some extra overtones. This horn is just asking for a bright, projecting mouthpiece, and then you just sound amazing. A nice vintage Berg, or a Guardala – lots of options here. This horn has the rare dark ‘chocolate’ lacquer that you only see on a few full pearls Super 20 tenors. It’s just about the most gorgeous saxophone finish ever. Overhaul uses high-end medium sized, flat screw in reusable brass resonators and looks fantastic. Original case is in good condition too. It is quite rare to find an early Super 20 in this sort of condition. Well worth buying whether you play a lot or a little. I have one of these myself, and it’s in my top tenors that I have played. King Super 20 Tenor Saxophone Original Lacquer Original pads Warranty Card Amazing! Well, golly. Here’s a 1949 King Super 20 tenor in nearly immaculate condition with original pads and original guarantee bond paperwork. Holy cow. It also has its original white mouthpiece, with original ligature and cap, and comes in its original case with the leather bell strap not only intact but supple and in good working condition. Sheesh. This horn looks to have been played a bit by its original owner, as evidenced by some light scratching in the lacquer here and there and some light wear on the thumbhook. The solid silver necks on these horns were originally lacquered, but the lacquer typically wears off so quickly and completely most folks are not aware of this fact. The fact that the lacquer on this neck still remains at about 40%, though speckled, shows that the original owner took extremely good care of the instrument and was quite finicky with his handling. Gosh. This Series I King Super 20 is about as fine as they come, and is collectible as-is or put a high end overhaul on it and let it sing. This horn is ready for its next steward, and at nearly 70 years old still has a couple hundred years of music making left in it, if you care for it as well as its original owner did. Goodness gracious. The King Super 20’s that were made in Cleveland (like this) are the most desirable type among most players and collectors. (As a side note, the early Eastlake horns can also be very good.) This one is original lacquer at about 95% with some minor play wear on the back of the body. The Super 20 is a classic jazz tenor. And this is a great vintage for getting a good horn for a good price. It has a nice, medium bright tone that can easily cut through with the right mouthpiece. It’s also a versatile, do it all kind of horn for most other types of playing. Super 20’s are great tenors, and mechanically clean ones like this don’t come around that often. Most of the ones you see are beat up (and nickel keywork is really hard to straighten out if it’s been damaged) and much later than this. King Super 20 Tenor Very Gentle Relacquer Full Pearls Silver Neck! This is a vintage Silver King Zephyr alto SN# 223xxx with double socket neck that just came in. It also has the three ring strap hook so you can change how the horn balances on the strap. It has an older repad, and the pads are still sealing. It has been mostly in the case since it was repadded several years ago, as you can tell from how little the silver has tarnished. The horn is in good condition, with nearly all of the original silver plate intact. The engraving is also nice, as is the deco bell support. This horn is the earliest Zephyr Special that I can find any record of existing. It may be the first, and it is definitely one of the very first. King Zephyr Special Alto 202xxx! Original Near Mint! The Zephyr Special is one of my all-time favorite saxophones. The dark, chocolaty lacquer color, the delicate, sharp bell key engraving, tasteful pearl side keys, solid silver neck, and the TONE – it’s the total package, unlike anything else. This is one of those rare ones that comes along about once every year or two at best that is really near mint and absolutely gorgeous. It comes in the original case too. These horns are really hard to find in this kind of condition, and they are increasing in value as people realize how sweet they are. King Zephyr Special Alto Full Pearls Original and Beautiful! It’s hard to take a bad photo of what is one of the most beautiful saxophones ever made. Engraving everywhere, pearls everywhere, silver neck, beautiful tone, light, flute-like action, the works. These horns are rare to see at all and especially hard to find in good condition like this. Everything about the Zephyr Special is deluxe, including the tone. King Zephyr Special Alto Near Mint Condition Original and Near Pristine! It’s hard to take a bad photo of what is one of the most beautiful saxophones ever made. Engraving everywhere, pearls everywhere, silver neck, beautiful tone, light, flute-like action, the works. These horns are rare to see at all and especially hard to find in good condition like this. Everything about the Zephyr Special is deluxe, including the tone. This horn also just received a deluxe overhaul by Matt Stohrer, and it’s ready to go. This is a mint condition, first year, original lacquer King Zephyr Special Alto SN#209xxx with full pearls and solid silver neck. It has no dents, no dings, no resolders and 99% lacquer at least. This is about as nice as you will find for a 70+ year old horn. It comes with the mint original case and it still has all original pads as well. This horn plays well on its original pads with a medium, complex tone that is natural for jazz. I like the Zephyr Special of this era as well as the later Super 20, so it is a chance to get a great horn for a bit less money and still get something that is in uniquely great condition. It includes the original Zephyr Special mouthpiece as well. This is a gorgeous, original silver-plated King Zephyr Special alto SN# 209xxx. Zephyr Specials are just about my favorite altos of all time for tone and sheer joy of playing. This horn has “full pearls” meaning that all of the side keys, octave key, and the G# have mother of pearl inlay. It also has the starburst engraving on all of the low key cups. The silver is basically all present, and the horn also has no past repairs and no damage of any kind. It has the original solid silver neck in excellent condition, and the original mouthpiece as well. This is an incredible, near mint condition King Zephyr Special tenor with full pearls and solid silver neck. This horn still has virtually all of its lacquer intact, including over the silver neck, which is ridiculously rare to see. Is the Zephyr Special the best tenor ever made? A tone to die for, and made to be deluxe in every way that it can be, this is the vintage tenor to get. I play one much like this already, or I’d be keeping it. King Zephyr Special Tenor Full Pearls 266xxx Overhauled Great! Here is a beautiful original lacquer King Zephyr Special tenor 266xxx with full pearls and solid silver neck. This is the later version of the Zephyr Special that is very much like an early Super 20 tenor (silver double socket neck, full pearls, similar tone etc.) Even more than the beauty, rarity and great build quality of this horn, the tone is the main reason to buy it. Simply put, this is one of the best tenors that I have played this year, and that is saying a lot. People play vintage horns because they just sound better than anything made today. And with a good overhaul, you know that you are getting a horn that is actually playing the way that it is supposed to. King Zephyr Special Tenor Full Pearls Original Lacquer Stohrer Overhaul! One of the finest examples of a King Zephyr Special that I have seen. Overhauled by one of the finest repairmen, and one of the finest playing vintage tenors period. Includes a nice, new case also. 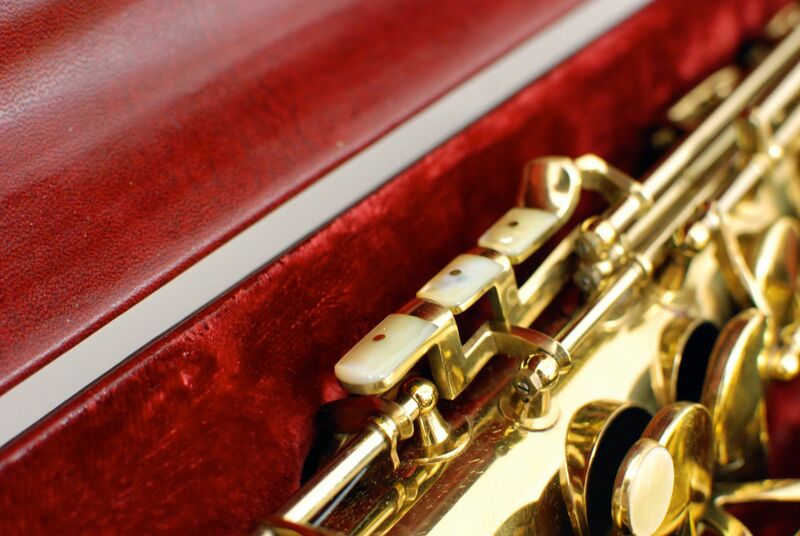 The Zephyr Special is an amazingly beautiful, ornate, and fun to play saxophone. It has a sonic world all its own. Nothing sounds like a King. This horn is big, wide, resonant and loud, but it is also delicate, rich, and projecting. The neck is solid silver, which gives it extra overtones and a focused kind of darkness to the sound. This is a gorgeous, original lacquer King Zephyr Special. These are hard to find, and nothing sounds like them. I play a ZS alto and tenor. If I ever get to help make a saxophone, it will be based on this model. It’s hard to beat. This is an incredible, near mint condition King Zephyr Special tenor with full pearls and solid silver neck. This horn still has virtually all of its lacquer intact, including over the silver neck, which is ridiculously rare to see. This Zephyr Special was made in 1941, which was a kind of pinnacle year for American saxophones. It’s rare to find any saxophone that looks this good after 73 years, and finding such a rare and desirable one is really special. The early King Zephyr saxophones were the professional model sax made by King in their day. They were succeeded by the famed Super 20, which was a development of the Zephyr’s design. This horn has the three ring strap hook, the double-socket neck, and a lot of the same keywork and feel of the best, and earliest Super 20’s. That means that you are getting a lot of horn for the money. This horn has been relacquered, and it was apparently done recently, judging by the color of the lacquer. Mechanically it is in good condition, with no evidence of any past damage or dentwork, resolders, or non-original parts. It’s a nice, relacquered Zephyr that it ready for someone to buy it and start playing jazz. After all, these are the quintessential jazz saxophone and that is what they should be playing. This horn’s pads are pretty old, but they haven’t been played much. It is being sold as-is, needing a repad to play its best. It ships in the original case which is in good condition.